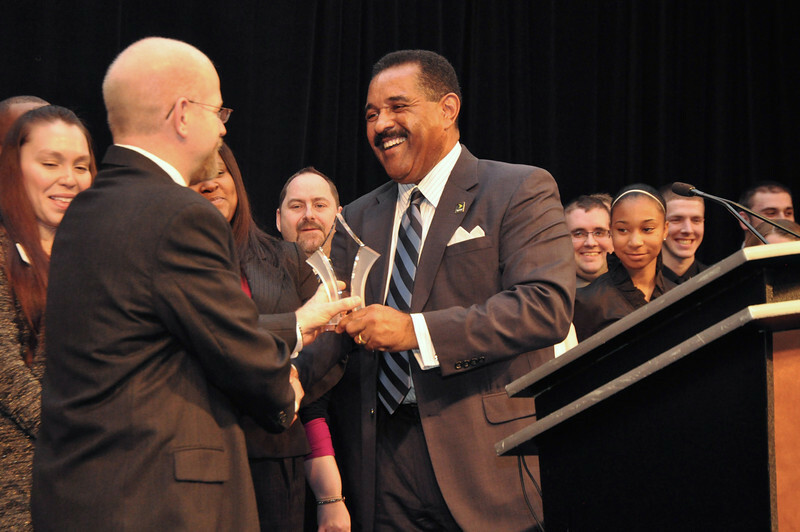 The Nonprofit Leadership Alliance has recognized Indiana State University as its Sprint Campus of the Year for 2013. The alliance selected Indiana State from among 55 colleges and universities nationwide. The award goes to the campus that exemplifies overall best practices in nonprofit career preparation and growth as measured by student recruitment, internship placement and marketing. The number of students completing Certified Nonprofit Professional designation is also a factor. "In the 12 years since Indiana State University joined the Nonprofit Leadership Alliance, the program has been a leader in fulfilling the campus' mission of combining higher education with community and public service", says alliance President Michael Cruz. "Indiana State is very deserving of this award." During the last academic year, Indiana State graduated 31 Certified Nonprofit Professionals, the second-highest number in the nation, Cruz noted. Indiana State alumni work for such organizations as Boy Scouts of America, Feeding America-Gleeners Food Bank of Indianapolis, YMCA of Greater Indianapolis, March of Dimes, Indiana University School of Nursing, Nashville (Tenn.) Area Agency on Aging and Disability, Terre Haute Children's Museum and the Greencastle Housing Authority. Katie Davis, a 2012 Indiana State graduate, credits the program with providing her with the skills and experience to land a position with Playworks, a national nonprofit in Milwaukee, from among more than 70 candidates. "I was informed that the wide variety of experience I could bring to the job was what made me stand out from the rest," Davis said. "Had it not been for Nonprofit Leadership Alliance, I would not have gained such experience. Students in the Indiana State program come from each of the university's five colleges and serve such partner organizations as Boy Scouts, Girl Scouts, Camp Fire, March of Dimes, Special Olympics Indiana, Indiana State University Foundation, Goodwill, Voices for America's Children, United Way of the Wabash Valley, Wabash Valley Community Foundation, and the YMCA of Vigo County. Students run such campus organizations as Autism Speaks U, Association of Fundraising Professionals, Indiana Student Education Association, Riley Children's Hospital Dance Marathon, Up ‘til Dawn fundraiser for St. Jude Children's Research Hospital and Vigo Colleges Relay for Life. "This program helped me unlock my full potential by having the opportunity to network with people from all over the United States," said Keenen Stevenson, a 2012 graduate. Stevenson served an internship at Voices for America's Children's national office in Washington. "The Nonprofit Leadership Alliance was a major stepping stone that helped launch my nonprofit career." Stevenson now works as a mentoring and administrative assistant at Court Appointed Special Advocates for Children of the District of Columbia. "Community engagement and experiential learning are core components of Indiana State University's mission, and we are excited to receive this recognition for the good work we are doing in preparing students for careers in the nonprofit sector," said university President Dan Bradley. "Congratulations to our many Nonprofit Leadership Alliance students and to their faculty mentor, Nathan Schaumleffel, for achieving national recognition in this important area." Schaumleffel, associate professor of kinesiology, recreation and sport and campus/executive director for the Nonprofit Leadership Alliance Certification Program, said he is "very proud of our program, the significant amount of good our students do for our community and the personal and professional growth that our students experience as they proceed to certification." Laaunched in 2001, the Indiana State program has grown from seven students in 2005, when Schaumleffel took over as campus director, to 140 students this year, one of the highest enrollment rates in the country. The Sprint Campus Partner of the Year Award is not the first for Indiana State. In 2008, the university received the alliance's Outstanding Student Recruitment Benchmark Award.The national award selection committee was comprised of Nonprofit Leadership Alliance stakeholders, including affiliated faculty members, alumni, nonprofit partners, board of directors members and sponsors. Founded in 1948, the Nonprofit Leadership Alliance exists to strengthen the leadership of the social sector and to sustain the ability of nonprofits to fulfill their missions with a talented and prepared workforce. In 2011, the Alliance launched its Certified Nonprofit Professional designation as the first of its kind nationwide. Certification demonstrates that a job candidate possesses critical nonprofit management and leadership competencies.